You are here: Home » General » Fabulous Fall Membership Cocktail Party – A Big Hit! Fabulous Fall Membership Cocktail Party – A Big Hit! The Opera Society enjoyed a delightful Fall Membership Cocktail Party on Saturday, October 25th, graciously hosted by our esteemed patroness, Barbara Copanos, at her lovely home in Sea Ranch Lakes. We had a good turnout of our members and their guests attended this time-honored event. Co-President Eric Koskoff opened up the evening by thanking Barbara for her hospitality and over 20 years of significant support for Florida Grand Opera and The Opera Society and for providing the drinks and scrumptious hors d’oeuvres. Ruth Molina then reviewed the upcoming events, including the Lyrical Luncheon, which will be held on November 20th. 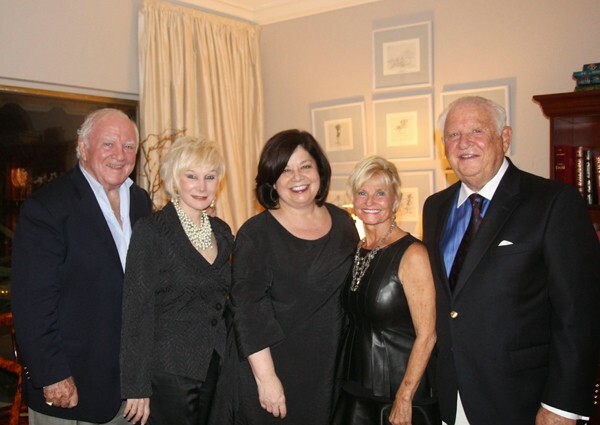 Ruth introduced Claire Crawford and Caroline Seabright, chairs of the Popular “Guess Who’s Coming to Dinner” series. They presented the roster of lunches and dinners, that included some annual parties as well as new parties. Sign up soon to ensure a reservation! Helena Caplan, VP of membership, presented a rose to new member, Barbara Franco, and welcomed her to the group. Brenda has joined our Board this year and we are excited about her energy and enthusiasm. Susan T. Danis, Florida Grand Opera’s CEO & Director previewed the exciting upcoming Opera Season. Enjoy the wonderful photos taken by our Public Relations Vice-President, Betty Young!